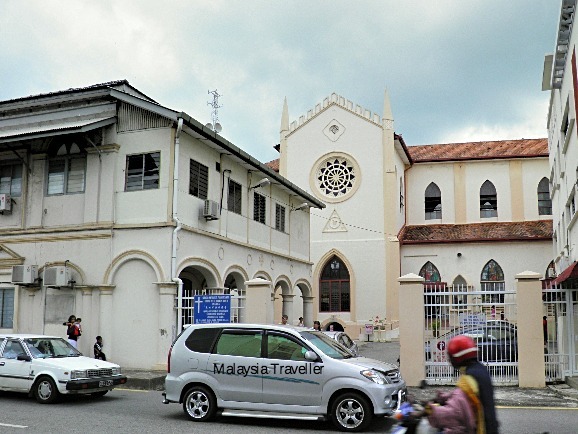 St Francis Xavier Church is named after one of Malacca’s most famous residents, St Francis Xavier, the ‘great missionary to the East’ who was based in Malacca on and off for several years from 1545 onwards. The saint died in 1552 on the way to China. His body was brought back to Malacca before being shipped to Old Goa where most of his remains still lie. 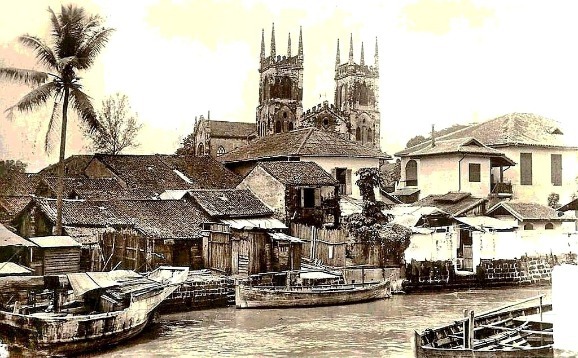 View of the Church of St. Francis Xavier and the Malacca River in 1936. The church was built in 1849 [completed in 1856] on the former site of a Dominican Church’s Convent of Our Lady of the Rosary erected by Fr. Gasper de Cruz in 1553. Reverend Peter Stephen L. Farve of France built this magnificent 19th century Neo-Gothic building in honour of St. Francis Xavier for his tirelessly [sic] effort in propagating the Roman Catholic faith. The design of this church, drawn by Reverend Jean Barbe, was based on the Cathedral of St. Peter in Montpellier, France. Well I’m not an expert but I cannot see a strong resemblance to Cathedral St Pierre in Montpellier. There is some similarity in the design of the towers but that’s all. 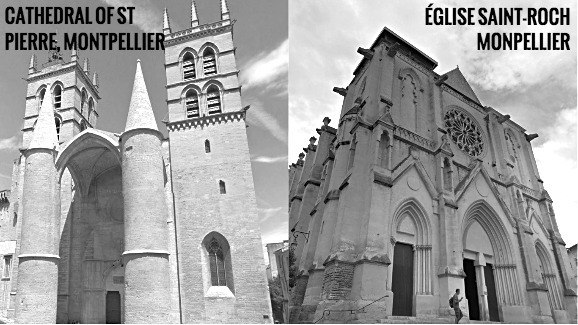 There is another church in Montpellier, Église Saint-Roch, with a facade which looks more like the one in Melaka but it does not have any bell towers. What do you think? A crypt can be viewed from outside. 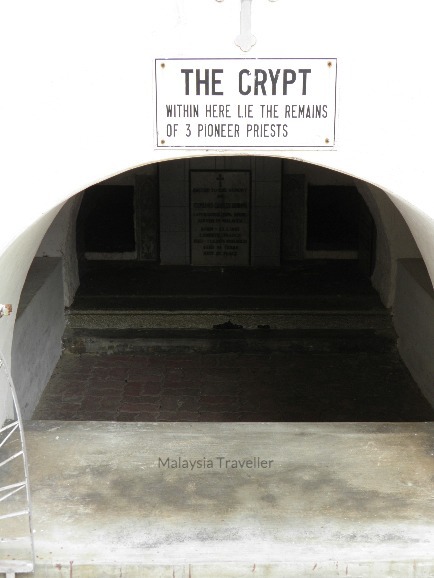 Among those buried here were two missionaries in charge of establishing a mission for the Mantra Orang Asli tribe at present day Kampung Ayer Salak, on the outskirts of Melaka. The priests were Frs Thomas Bourlier (died 2nd April 1855) and Charles Desbons (died 11th May 1876). Both died of malaria. The interior of the church comprises plain whitewashed walls decorated with coloured stained-glass windows. 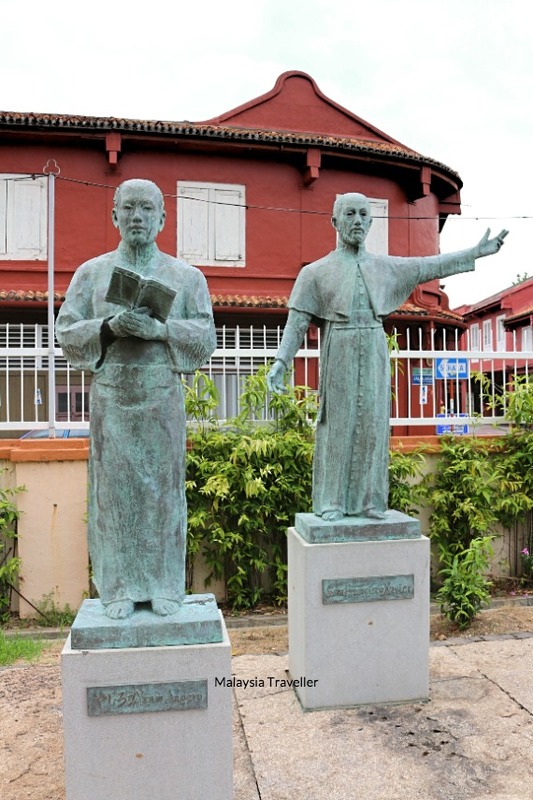 In front of the church are two statues, one marked San Fransisco Xavier (St. Francis Xavier) and the other marked Yajiro Anjero (more usually spelt Anjiro). Anjiro was thought to be the first Japanese Christian. Presumably his real name was Yajiro and he was given the nickname Angelo by the Portuguese which then was transliterated as Anjero. Confusingly though he was baptised Paulo de Santa Fé. It is said he was a samurai from Satsuma in Kyushu who killed somebody in a brawl and had to flee justice. He was accepted onto a Portuguese ship at Kagoshima and brought to Malacca where he met Francis Xavier in 1547 and gave him the idea that Japan would be a suitable place to spread Christianity. Francis Xavier took Anjiro to Japan as translator in 1549. With only limited success in Japan and with Christians facing persecution there, Francis Xavier moved on to China in 1552, leaving Anjiro behind. Anjiro was later driven from his mission and he took up life as a pirate until his death. 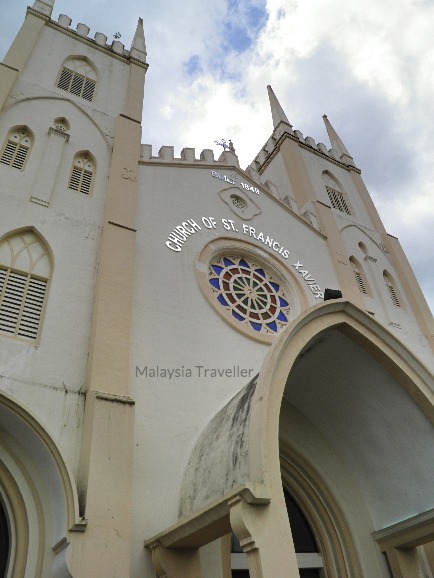 You can read another article I wrote about St Francis Xavier in Melaka on my blog. There are many nearby attractions here in the heart of historic Melaka. See my Melaka Heritage Trail for details.